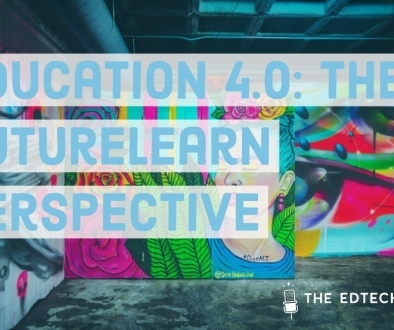 After a heavy concentration of artificial intelligence at the summit, covering everything from facial recognition to optimise student and teacher performance, to pens using image recognition to throw written student homework to the cloud for real-time feedback by online tutors, we approached the discussion largely from the point of view of how edtech companies are honestly approaching and assessing AI as an appropriate tool in their product roadmap. 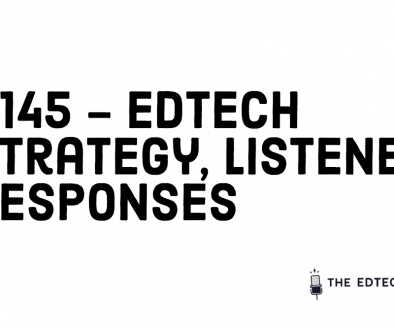 Given the excitement around machine learning capabilities and the edtech nirvana of personalised learning, one would be forgiven for thinking that investors “expect” to see AI in edtech companies from day dot. Don Burton, Co-Founder of New York Based VC Fund, Learn Start ensured this was absolutely not true and not appropriate for early stage startup companies operating a MVP and keeping costs low. I wondered if Chinese investors had an alternative standpoint, given the Government strategy around Artificial Intelligence, but Bill Ning, Partner at Blue Elephant Capital and Beijing’s iFutureWorks accelerator said that it was not necessary up front (even if being an online internet education company was desirable). It’s worth remembering that Chinese edtech Unicorns like English-language learning company VIPKid started off as brick and mortar training companies which have scaled enormously by later placing their business online and integrating AI functionality. 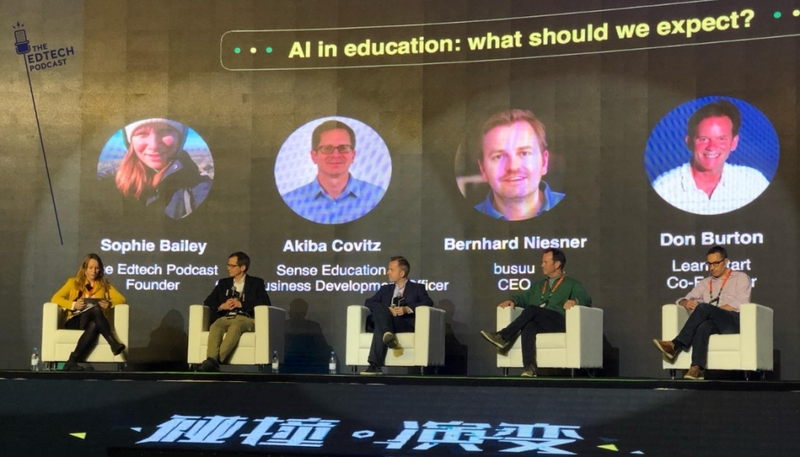 Bernhard Niesner, Co-Founder & CEO of language learning company Busuu talked about how Busuu had launched 10 years ago when data analytics was the buzzword of choice. Now, with 80million users, they have swooped on former Cambridge Analytica employees to build out AI technology to optimise their service for the volumes of learners they provide for, but they don’t foresee AI neural machine translation technologies like WaverlyLabs as likely to destroy the need to learn languages because of the cultural “glue” learning a language has in us as collegiate humans. Don Burton, Co-Founder, Learn Start talked about the need to balance cost vs. scale and also to look at whether building in house AI was necessary when the large tech players, like IBM Watson, are pouring so much resource into specialising in this area. This was interesting in contrast to Sense education an “AI-first” company utilising the AI used to order the world of genomics and now applying the same idea of “batching” to address learning gaps (led by serial entrepreneur and disruptor Seth Haberman). Interestingly, Busuu are also using AI to understand course uptake, revenue projection and resource allocation. Don Burton, Co-Founder, Learn Start talked about AdmitHub in the US who use chatbots to help with the students admissions process (also like BridgeU in the UK minus the chatbots) and KinderLine, a company using AI to help optimise staffing and reduce costs in the early years setting. (This reminded me of Australian company Edval who use algorithms to help optimise timetabling in schools to the same effect). Artificial intelligence can be used to replace exam culture with continual informal assessment, sometimes using games or collaborative simulations. AI can also help to reduce the bias implicit in human nature and our imperfections given tiredness and inconsistency. (Something Bill Bonk, Second Language Measuring Expert, Pearson mentioned on his recording of The Edtech Podcast in episode 99 which you can listen to here). Rather than just being stuck with a wrong answer, students can use computer vision & imaging processing such as online pens which throw a students homework to the cloud for instant feedback (Netease) or photos (Wolfram Maths) to understand the working of deep problems. In recruitment, companies like Pymetrics are also using the combination of AI and neuroscience to better field candidates for roles based on core competencies rather than grades on paper. We delve into some of this in the episode below. (Imagine a World of Assessment without tests). From entire AI Language learning apps like LiuLiShou, to companies like DAdA who are using facial recognition technology to profile student and teacher engagement to “optimise” learning, to companies like Carnegie Learning or Songshu AI Learning, AI is being used to sort and order vast quantities of content, and student data points to provide learning pathways. Online tutoring “unbundles the teachers role”. The course content is already done. For language learning, pronunciation can be done by the machine, as can grading. 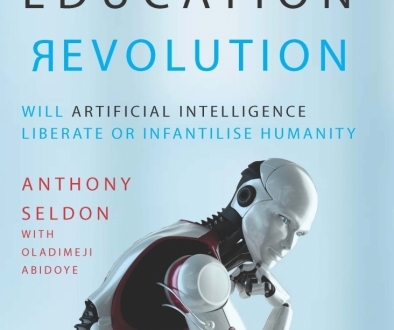 Could Artificial Intelligence replace feedback by a human educator? Can humans evaluate thousands of students’ submissions to provide each one with detailed feedback? The answer is also NO. We are social creatures, of course, and peer to peer learning has been shown to be beneficial once initial knowledge based learning has taken place. Cooperative learning is most powerful after the students have acquired sufficient surface knowledge to then be involved in discussion and learning with their peers – usually in some structured manner. Whilst a lot of focus is often placed on personalised 1:1 learning services, Sense education is looking to reverse the lack of engagement trend we see with MOOCS by using AI to batch students into “natural” groups of peer to peer learners. Again, DifferChat in Norway, uses chatbot technology to support peer to peer learning and the National College for Nuclear Training in the UK is looking into adding AI technology to its VR simulations to train engineers in group scenarios and assess collaborative working. Hopefully we will continue to see thoughtful use of AI technology which remembers our social needs and as a panel we discussed how to keep the learner at the centre of any technical capabilities applied to education. (Something Nancy Xu from Cevolution called for in an earlier human-centred design session). Indeed, I was also pleased to see Richard Tong from Songshu AI Learning presenting ahead of us who previously spoke on the podcast with the International Learning Technologies Standards Committee AI chapter on the need for a new hybrid professional – a learning engineer – combining the specialisms of an AI technologist who is also trained in learning sciences and pedagogy. (Richard is opening the Chinese regional division of the AI Chapter of the standards committee). Whilst in the UK we have the Institute for Ethical AI in education in the UK just launched at Parliament, (a combined force of Sir Anthony Seldon, Vice Chancellor of the University of Buckingham, Priya Lakhani of Century Tech & Professor Rose Luckin of UCL Knowledge Lab), Stavros YIANNOUKA, Chief Executive, World Innovation Summit for Education also talked at GET Summit of the need for global partners to sign up to a hypocratic oath of AI developments in education for social good. As always we ended the panel asking for books or recommendations on AI or how we learn. For my part, I would recommend happily trawling the podcast archive, to discover episodes like this one with Murray Shanahan of Imperial College London and Deep Mind on the technological singularity and what AI might mean to us as infantilised learners and this one on AI, assessment and removing bias in how we grade. I am also loving this flowchart from Karen Hao, the artificial intelligence reporter for MIT Technology Review, on whether something really is AI or not! I’m collecting my guests’ recommendations back in and will publish their books below very soon! See you at the next GET Summit! iTunes, Spotify, Stitcher, TuneIn – and now Google Podcasts!